GARDENING BY THE MOON: ARMYWORMS and GRUBWORMS, oh my! They are back! Fall armyworms are marching across Texas and feeding in your turf areas and on many other plants. They are called armyworms because of the size of the infestations and the way they eat their way across an area. After hatching, the newly emerged larvae start immediately eating. The caterpillars range in color from shades of brown, to gray to green or yellow-green. Distinguishing characteristics are a whitish inverted i between the eyes and whitish strips on the head. They appear first on the tips of the grass blades and if not detected, they eat through the grass. Initial damage resembles drought but on closer inspection, you can tell the grass has been defoliated with only stems remaining and you can see the caterpillars. To control, apply a liquid or granular turf insecticide that has armyworms on the label and can be purchased from any of the local garden shops. The liquid control can be applied with a hose on sprayer. The granular product can be spread with a fertilizer spreader. Products to look for include Ortho Bug B Gon (liquid or granular), Spectracide Insect Killer for Lawns (granular or liquid), Sevin (liquid or granular) or for organic control, apply Neem Oil or Bacillus Thurengiensis (BT). Follow all label instructions when applying. If these armyworms are eating your vegetable garden, make sure to use a product labeled for use on vegetables. If damage is present, after treating, go ahead and fertilize to encourage recovery. These armyworms eat and move through an area quickly, so be on alert! Now along comes another lawn-eating insect – grubworms. This insect is stealthier because it is working under your turf. 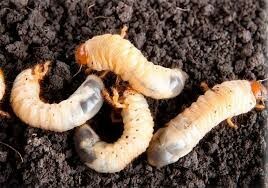 Grubworms are the larvae stage of that late spring, early summer, pesky June beetle that swarms around your lights. When you see them spinning on the ground, they are actually working their way down into the soil through the grass so they can lay their eggs. These eggs hatch and turn into root-eating grubworms. As they eat their way through your lawn, the grass turns brown because the grubs have eaten the roots. If grubworms are present, you can walk across your lawn and feel it slipping under your feet, much like newly laid sod. In fact, you can reach down and pull up your sod just like it was new. For control of grubworms, apply a granular lawn grub control product. There are several on the market and that can be purchased at your local garden supply store. Follow all label directions when applying. If you have not yet fertilized your turf, do so now to help with recovery from the damage. If the rain stops, water your lawn to help it regrow roots before it goes into dormancy. For some of you this has been a double whammy with the armyworms and grubworms. The good news is that they can be controlled. Continue to monitor your turf and treat when you find these pests!